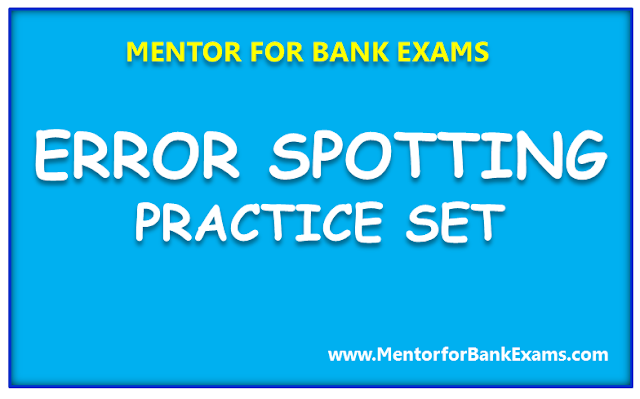 Here are English Error Spotting Questions for upcoming Banking Exams. 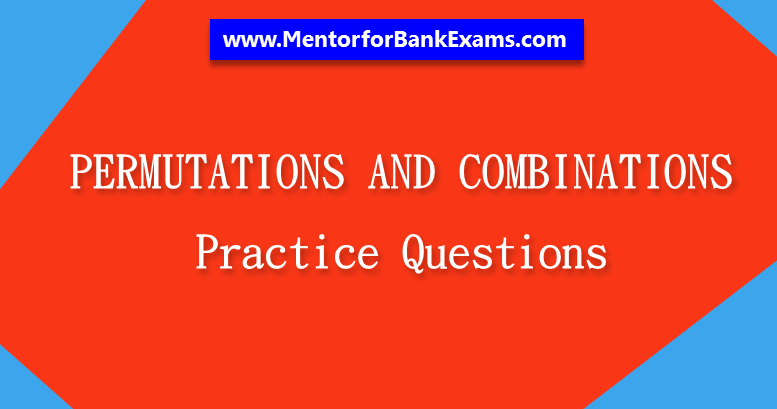 This quiz contains important questions which match the pattern of SBI PO/Clerk and other Banking Exams, so make sure you read today’s SBI PO/Clerk English Questions to enhance your preparation level. Quantitative Aptitude (Data Sufficiency) Section has always given heebie-jeebies to the aspirants whenever they appeared for a banking examination. As the level of every other section is has only got complex and convoluted, there is no doubt that this section, too, makes your blood run cold. The questions asked in this section are calculative and very time-consuming. But once dealt with proper strategy, speed and accuracy, this section can get you the maximum marks in the Quantitative Aptitude section. Reasoning is a game of wits and presence of mind! Yes, it is true and it might seem as the greatest of the challenge after English Section’s surprises but yet this one can easily be dealt with. You just need correct practice and hardwire your brain to quickly make decisions of what to attempt and what to leave. Practice with these Reasoning Questions for upcoming Bank/Insurance Exams. Note: If two symbols are given than by default first symbol is consider as Day and second one is considered as Month. 1. D.O.B. of Ranjeet is ## 2007 and he is only $ days older than his cousin Karan then what is the D.O.B. of Karan? 2. Four friends planned a ? days trip to Goa starting on @? 2013 but they returned from Goa on &? 2013. So, what was the difference between the planned stay and the actual stay? 3. Heena correctly remembers that her birthday is between @? 1984 and &? 1984 But Heena’s mother correctly remembers that her birthday is in month of ? but her birthday is between # and / but it was an odd numbered day. What is the correct birth date of Heena? First 12 even numbers are written from top to bottom. The letters of word 'ORANGE' are written in alphabetical order against each multiple of 4 (One letter against one number from top to bottom). Number of elements between O and % is same as number of elements between R and $. ? is written above % but below &. There are more than 7 elements between # and @. @ is written somewhere below #. 4. How many places are there between A and @? 5. Which of the following elements is/are written adjacent to ‘?’? 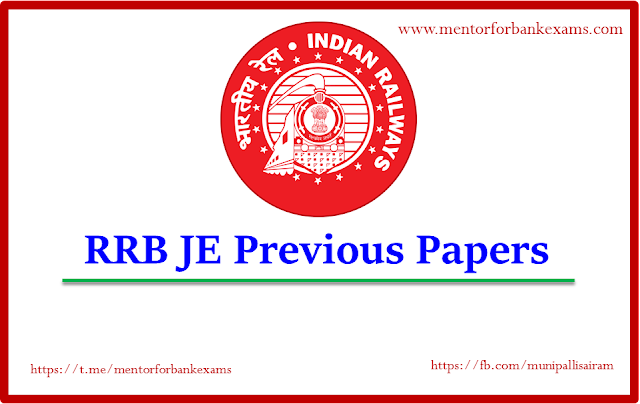 Eight candidates Naman, Aman, Arun, Karan, Gautam, Ravi, Rahul and Sumit gave their interviews for selection IBPS PO in the different weeks of January Week-1, Week-2, Week-3 and Week-4. The interviews took place either on Saturday or Sunday of these weeks. The interviews took place in Agra, Gorakhpur, Varanasi, Jhansi, Kanpur, Noida, Meerut and Mathura not necessarily in the same order. They scored different marks in these interviews such that even marks were scored in the odd numbered weeks except Week-1 and the odd marks were scored in the even numbered weeks. The candidate who scored 43 marks came from Jhansi. Candidates from Gorakhpur and Jhansi took their interviews at a gap of 2 interviews. Naman's interview was just after Gautam who scored 55 marks. One of the candidates scored 39 marks. 6. How many persons took their interview between Aman and Ravi? 7. What is the average of the sum of the marks scored by Arun, Naman and Sumit? 8. Which of the following is the correct combination of the persons who have their interviews on Saturday? 9. How much marks were scored by the candidate who was from Gorakhpur? 10. If only top 3 candidates are to be selected on the basis of the marks then who among the following will definitely be selected? Dear Students, As you all aware, the most challenging and toughest exam SBI PO has notified. So start your preparation early to get placed in most reputed bank. In the English section, there were total 30 questions. Reading Comprehension 10 Q, Cloze test 10 Q and Phrase replacement 10 Q. In this post, we will discuss questions related to 'Reading Comprehension'. These types of questions are based on the Reading habits and vocabulary. Students are advised to revise vocabulary and Read a lot and practice RCs daily. Here is the most important terms used in both Banking and Economics, FERA and FEMA. Most of you might be well aware of these terms and their functioning. In a university there were seven complexes P, Q, R, S, T, U and V situated across a street. The complexes were built facing north. 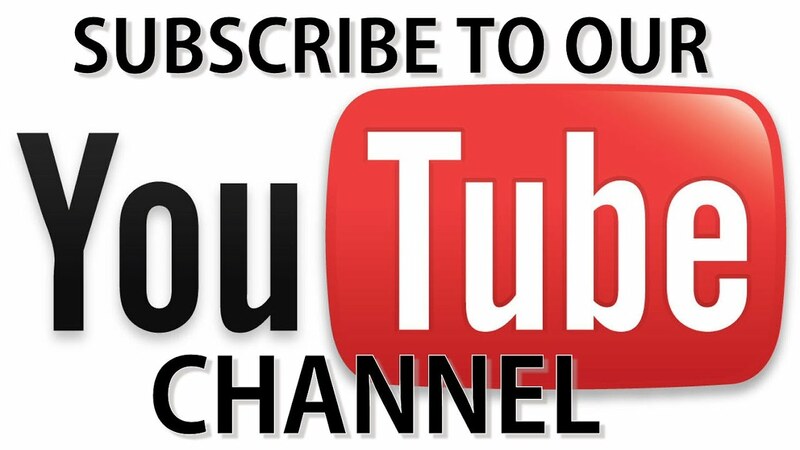 Each complex have students of different courses B.A., B.Com., B.Sc., B.E., B.Tech., B.B.A. and B.C.A. not necessarily in the same order. The distance between each complex was a successive integral multiple of 5m. The distance between each complex increased from left to right. 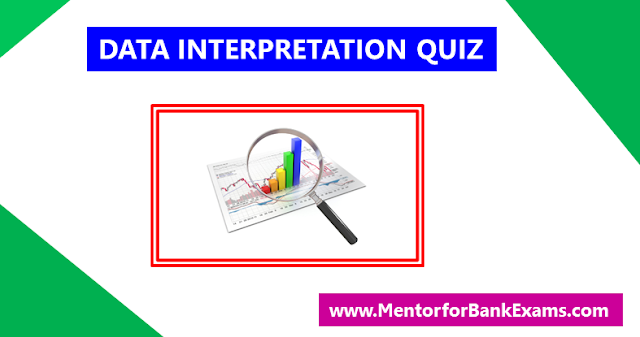 Direction (1 – 5): Study the table chart carefully and answer the questions given beside. The given tables provides the breakup of the total cost (in lakhs) incurred by NTPC which sells electricity for five years. Directions (1 – 2): In the question given below, a short paragraph is given, whose three/four sentences are highlighted in bold. From the given answer choices, choose the option that represents the correct combination of sentences that are contextually incorrect. The Pie-chart shows the percentage of different types off employees in an organization and the table shows the percentage of employees recruited through two modes for the different posts among them in the organization. 6. Find the total number of employees of direct-recruit Clerk, Officer Scale I and Officer Scale II? 7. What is the difference between promotee-recruit officer scale II and direct-recruit clerk? 8. Promotee-recruit in Officer Scale II is what per cent of direct-recruits in Officer Scale III? 9. Find the total number of employees in direct-recruit Officer Scale I and promotee-recruit Officer Scale IV? 10. What is the total number of direct-recruit Officer III? 11. Bhuvan and Kachara started doing the work. After working for 5 Days they left the work for Tipu. He completed his part of work. Now the remaining work was completed by Arjan in 7.5 days. In how many days can Arjan complete whole work? 12. Due to fever Tipu did not joined the work but Ismail took his place , who can complete the work in 25 days. He did Tipu’s part of work. After that khachara joined the work but worked for same number of days as Ismail. If remaining work was completed by Bagha who is 300% more efficient than Lakha then in how many days was the whole work completed? 13. 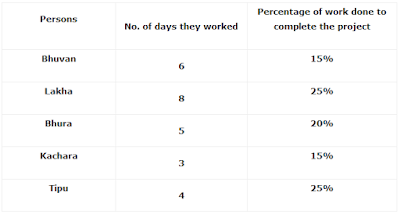 Mukhia took 5 less days to complete the work than Bhura and Goli is 60% more efficient than Bhuvan. They worked together for 5 days and left the work, after which the remaining work was completed Tipu in? 14. Lakha and Bhura decided to complete the work in 27 days. Starting with Lakha they worked alternative for total 20 days. After that Bhura left the work but Lakha did it for 2 more days. After that he also left the work. Now Guran completed the remaining work on time. Then find how much time Guran will take to complete the whole work. 15. 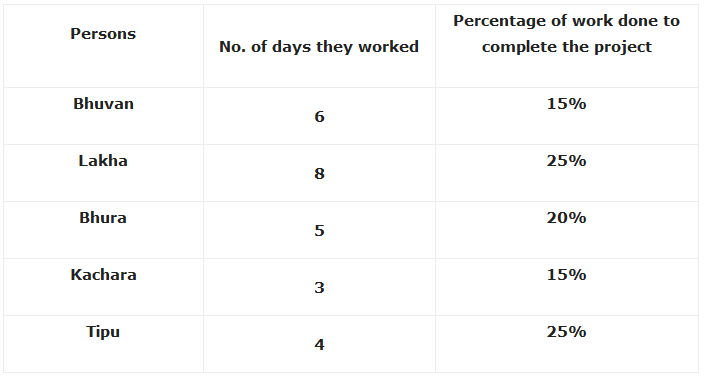 Lakha and Tipu are in team A and Mukhia and Khachra are in team B. if Both the team decided to complete the same amount of work separately then find out which team is more efficient and by how much days ?